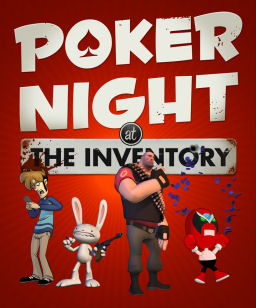 Poker Night at the Inventory, the second casual poker game by Telltale Games, was released on November 22, 2010. It was the second game in Telltale's Pilot Program, a system where quirky concepts are given one episode, and if media and fan response is high, more episodes will be produced. The game was well received, thanks in no small part to the Team Fortress 2 unlockables included in the game, and Poker Night 2 was released in 2013. Poker Night at the Inventory was the first game by Telltale Games to feature crossovers from their previous titles (as well as characters from other games). It starred Max from Sam & Max, Strong Bad from Strong Bad's Cool Game for Attractive People, Tycho from Penny Arcade Adventures (using a different model and a voice actor for the first time), and The Heavy from Team Fortress 2. It is a spiritual sequel to Telltale Texas Hold'em, and as such contains references to the game that inspired it (among many references to the games and media of the starring characters).